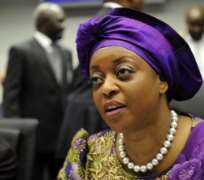 The Economic and Financial Crimes Commission (EFCC) has confirmed that the process for the extraditing former Minister of Petroleum, Mrs Deziani Alison-Madueke from the United Kingdom has begun. According to Orilade, EFCC's Operations Department has made presentation to the Legal Department to commence the process, and that process has commenced. “It is ongoing. Within the next few weeks, the extent to which we have gone will be made known to the public. It is not a fresh case; it is not a fresh petition that is just being looked into; the whole process is a total package. This extradition is just an aspect of Deziani's investigation and commencement of trial,” he said. In October, 2017, the Minister of Justice and Attorney-General of the Federation, Abubakar Malami, had said that Nigeria had no immediate plan to bring Allison-Madueke back home to face trial. “Steps have been taken by the United Kingdom authorities on issues bothering on corrupt practices involving Nigerians. If Nigeria feels strongly that there is need to bring Mrs Diezani Allison-Madueke here to face charges of corruption, government will not hesitate to do that. As things stand now, there is no need for that since the UK Government is already investigating her,'' he had said.